Adventures In Storytime (and Beyond): Whoo-Whooo Loves Storytime? I haven't seen anything inspiring lately, so today I ended up recycling a theme I've done before (owls), but found a couple of different books to use. I also ended up having another library employee accompany me as part of a job shadow. We started with our welcome song, then I told them I was going to give them clues and see if they could guess our theme. I first told them our stories were about an animal that sleeps during the day and is awake at night. I fully expected to have to give them an additional clue, and just as I was about to after several incorrect guesses one little girl got it. We then talked about how owls are nocturnal, and they have such big eyes to help them see at night. 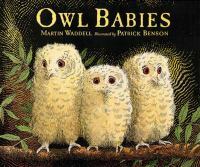 We sang our story song, incorporating flapping our wings and saying "Whoo-whoo", then read our first book, Owl Babies by Martin Waddell and Patrick Benson. This classic is one of my favorites. The baby owls are adorable as they wait for their mother to return, become more concerned the longer they wait, and little Bill wailing "I want my mommy!" over and over. Children can easily relate to missing their parents, and being excited to see them again. 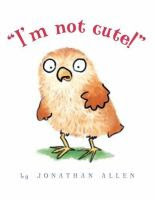 For our second book I chose one of Jonathan Allen's Baby Owl series, I'm Not Cute! This is a very cute series that is both funny and sweet. In this story, Baby Owl wants to be seen as the strong, fierce hunter he will be someday, and gets upset when everyone keeps saying how cute he is instead, saying "I'm not cute!" over and over. But when Mama Owl agrees with him, he gets upset because he now wants to be cute, and Mama knows he just needs a nap. This is a good opportunity to talk about how being tired can make us cranky and more prone to tantrums, and that's why sometimes we just need to go to bed. I followed that with a pair of "Five Little Owls" rhymes, first counting up and then counting back down, using a different hand each time. 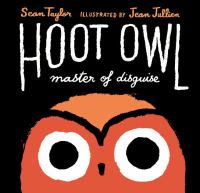 For at last book I found one that is a little funny and a little dramatic, Hoot Owl: Master of Disguise by Sean Taylor and Jean Jullien. Hoot Owl is hungry and on the prowl when he spies a rabbit. Being a master of disguise, he dons a carrot costume to try to lure the rabbit closer. When that fails, he then tries to get a lamb, followed by a pigeon. Despite his prowess, he is unable to catch any of them. Then, finally, he finds a unexpected target that can't run away. Kids will like name the disguises and predicting whether Hoot Owl will be successful or not, and the striking illustrations help keep their attention. We finished up with our closing song and handed out owl stickers, having the kids identify the colors of their respective owls. The kids seemed to like all the books, but were most attentive with Hoot Owl: Master of Disguise, perhaps because of the slightly dramatic tone or maybe they had just finally settled down. The loved pretending to be owls with the song, but some got distracted during the counting rhymes. Their reactions to our guest observer were funny and unexpected. I thought they would get excited, and mob her asking her name and such, but instead they just stared at her, some seemingly with suspicion. I'm really not sure why, other than the fact I've never brought anyone else before.